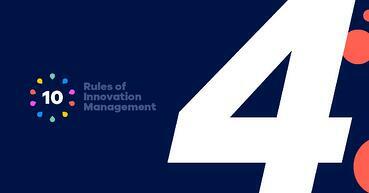 This is the fourth part of the broader series on "The 10 Rules of Innovation Management." In five publications, I’ll share 10 best practices that should come in handy if you’re managing an online, collaborative innovation management program or thinking about launching one. Last time I shared my views on seeding and advocates (Rules 5 & 6), and now it is all about communication and transparency. Let's start with the seventh rule, which focuses on communication. Your entire potential crowd needs to be aware of your innovation program. You want them to be aware so they can participate, of course, but awareness is also essential to preventing similar initiatives from popping up elsewhere in the organization, which could later cause issues with best-practice sharing or implementation scaling. Create your own internal branding and tone of voice that should deliberately differentiate you from your standard corporate communications. You're doing something unusual here by asking for new ideas and operating in the "fuzzy" frontend of innovation. Be proud to be different and act like it! And make sure everybody is aware. Run "above-the-line"/mass media promotional activities like posters, videos, intranet messaging, etc., to explain how the program links to the company strategy, what is going to happen, and what you expect from your crowd. David Willets, Head of Innovation at Baxi Heating, took this advice seriously and shared his story with me. "When we relaunched Baxi’s idea and innovation management program, we inherited a boring orange lightbulb as our logo, and this had become our identity. It looked like someone had typed 'innovation' into a clip art search box from the '80s. Considering we wanted to do things differently and encourage others to do the same, this logo wasn't going to cut it. Everyone loved it, and after we'd calmed down, we decided that the X would be our thing and represent doing things differently at Baxi. With anything new, you have to get people to take notice, and if you're saying you want people to do things differently, you have to live by that and show them that you are prepared!" A surefire way to kill your innovation program is by not responding to ideas. People that submit an idea but then never hear back will turn into skeptics and eventually stop participating altogether. It's critical that you thank them for their ideas and ask them to elaborate where necessary, and then provide feedback on that again. Yes, this is a cumbersome task, so make sure to involve a broader team for this. And if you do it right, it's just amazing to see your crowd collaborate and turn those initial hunches into fully fledged solutions! The primary objective of your innovation communications plan is to engage your crowd. Deliberately explain what kind of behavior you'd like to see from them. It's not just about submitting ideas but also about commenting on others' ideas or providing feedback on proposed plans. Involve more and more people into the discussion by sharing ideas and asking for their feedback. And, even though you're aiming for online collaboration, don't forget about being present offline as well! Create trust by showing that there are humans behind this online platform. Decorate your offices with triggering posters or stickers, or kick-off your new campaign with an offline ideation session. You want senior management sponsorship. You need it to show employees it's okay to spend time on the program, to promote engagement among middle management, to make portfolio decisions, to provide budget, etc. Report on innovation metrics (which I'll discuss later in this article) and make sure to communicate the value that is of specific importance to these "C-levels." Continuously inform and educate them, and over time, you'll create strong supporters – especially if you can wow them now and then. Innovation is exciting – especially at the creative, divergent, "nothing-is-bad" start, and, of course, at the end when launching your new-to-market product or service. In between, however, it can become quite a tedious process, continuously investigating if your new idea makes sense. Build, measure, learn sounds super simple and straightforward, but after your umpteenth iteration, you (and your management even more so) might just want to move on to the next phase. But keep communicating about your progress. If implementations are stalling, you might be able to celebrate that new employee groups have been engaged, top innovators recognized, or new innovation methods inserted in your process. Keep communicating because as soon as you stop, business-as-usual will again absorb all attention, ceasing your innovation activities. Educating your crowd on processes and innovation theories will create a climate where people share, discuss, and improve ideas. Over time, you can consider training your employees more in-depth on theories like Design Thinking or Lean Startup (for instance via "Adobe Kickbox"-like workshops) to improve idea quality. While building your innovation management program, you'll need to overcome skepticism. Innovators may experience the process as vague or fuzzy, and others may think it's all just a waste of time that can never result in actual benefits. You'll need to show the complete process and report on key performance indicators (KPIs) to build trust, grow sustainable sponsorship, and engage your audience. Make sure innovators understand the full process before submitting an idea to generate faith and believe submitting an idea isn't just a waste of time. Present the timelines and also what experts you have available to grow and evaluate the ideas. And when you've chosen the top ideas for implementation (or other next steps), make sure there's a transparent transition of the ownership. The person that came up with the idea isn't always the best one to take the idea forward and realize it; be aware of this and have other experts available which, when adequately showcased upfront, will create the confidence an idea will actually be implemented. Rigorously report on outcome KPIs, like ideas handed over, revenue potential, realized revenue, and savings. Without demonstrating the value added, the program will be killed over time. Initially, you may be able to please management with participation and submission numbers, but we all understand an idea on its own is nothing; it's the execution that brings value. "... an idea on its own is nothing; it's the execution that brings value." Therefore, run “low hanging fruit” campaigns early on (cost savings, process improvements, or other tactical topics that are of significant interest to your senior management). Proposals coming from these campaigns tend to have shorter implementation cycles than those from more radical campaigns, which will then allow you to show real value sooner. Presenting actual results will close the loop and further promote the use of campaigns to solve challenges. But what KPIs should you report on? Many companies want to measure their innovation activities with traditional metrics, like return on investment (ROI), to decide what ideas to take forward based on business cases. Although this may work fine for ongoing operations and continuous improvements, it's often counterproductive for (radical) innovation as this comes with a lot of uncertainties that negatively impact the validity of your calculations. The must-read book "The Corporate Startup," by Tendayi Viki et al., describes three types of KPIs: (1) Reporting, (2) Governance, and (3) Global. These three types of KPIs can all be divided in "Activity metrics" (like number of ideas, MVPs, coaches, events, etc.) and "Impact metrics" (like number of assumptions identified, business models validated, patents granted, etc.). Especially in the beginning when you don't have (many) ideas in your pipeline yet, you probably report on the percentage of employees engaged, the number of campaigns ran, and ideas generated, but you can only get away with that for so long. Eventually, you'll be required to deliver insights into how ideas progress through your funnel and how this impacts the bottom line. But please be careful and don’t let it become your program’s single assessment criteria; I've seen small innovation teams being held responsible for the "executing" backend and "realized ROI" while they only had influence in the "searching" frontend of innovation. To summarize, it’s most important to thoroughly know and continuously inform your stakeholders. These stakeholders include your idea generating crowd(s) – like employees, customers, suppliers, students, governments, etc. – and your senior and middle management. Make sure that you understand what makes them tick and focus your communications around that. Besides the communication to engage and enthuse, make sure to report on innovation metrics. These metrics should be considered in light of your innovation ambitions and are likely to grow with the maturity of your innovation program. [UPDATE] Check out the Coffee Break Webinar recording for Rules 7 and 8 here where I answer your questions (and more!) from the comments below. Note: already signed up for the "10 Rules" series? Check your inbox! If you still have questions Evaluation and Recognition, leave them below or email them to 10RulesofIM@hypeinnovation.com. The next publication covers the final two rules in this series: Evaluation and Recognition. We’ll look into different evaluation scenarios and discuss how diverse innovation campaigns require distinct approaches. And then we end the series as you should end your innovation efforts: with recognition! I’ll explain why recognition is important for collaborative innovation management programs, whether monetary or non-monetary awards are most effective, and we'll end with some of my ideas to get you started! Read it here! 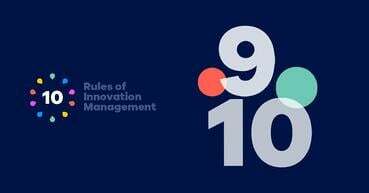 If you haven't signed up for the "10 Rules of Innovation Management" series, it's not too late! Register here to get content straight to your inbox! 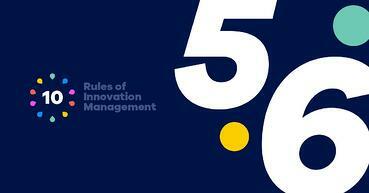 Roel has lived and breathed innovation management for the most significant part of his career. It's where his heart lies. Roel founded, designed and led the global collaborative innovation initiative Spark at Liberty Global for seven years. Roel studied at the renowned Dutch University Nyenrode where he received his Master's degree in Business Administration and the Entrepreneur Award for best startup. Now – as Innovation Management Consultant - he wants to apply this knowledge by helping other organizations in their innovation efforts.